Darby McDevitt told me last week that the lead characters of Assassin's Creed 1 and 2 aren't related. I've played a lot of each Assassin's Creed game. I thought I knew the important stuff about Altair and Ezio, the series' two heroes from the past. 1) Altair and Ezio aren't related. I simply assumed they were, since the AC series is about a history-spanning conspiracy that is being revealed as a guy named Desmond relives the memories of his ancestors from game to game. 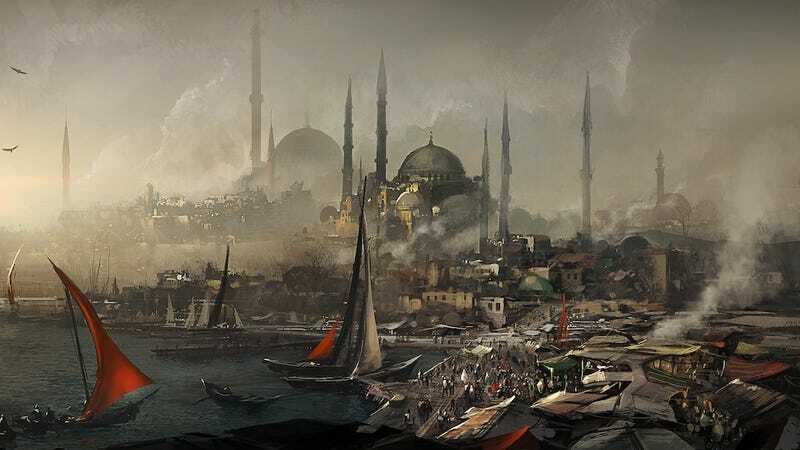 In the first Assassin's Creed, we played as Altair, via Desmond reliving his memories. In AC II and last year's AC Brotherhood, we played as Ezio via Desmond. In this year's Revelations, we play as Altair and Ezio, via Desmond. But our two old heroes aren't related, McDevitt told me. He was standing in front of a demo of the game during a showcase for games publisher Ubisoft when he told me this, by the way. He said it casually, explaining that there was no reason to keep it a secret these days. So... Altair comes from one side of Desmond's family and Ezio the other, I guess. I don't know if this is a big deal, but I was shocked. 3) This game was at least semi-intentional. This is more on you, readers, especially you skeptics who say that Ubisoft didn't always plan for three Ezio console games. As we've reported (because McDevitt doesn't just tell these things to me), Revelations, this third Ezio Assassin's Creed game, was originally going to be the planned 3DS game Lost Legacy until someone higher in Ubisoft mandated it should be a console game. McDevitt told me it's because they loved the setting. I suggested it also might be because they love having Assassin's Creed games each year. So I wasn't completely wrong about Revelations, and the game still looks very good. All is well, it seems. Look for Revelations later this year. Hopefully Ubisoft isn't wrong about trying to make another great Assassin's Creed just a year since we got the previous excellent one.